Believe it or not, it was really difficult in earlier versions of Acrobat to simply copy/paste portions of a PDF back into the same PDF – especially for scanned documents. Previously, you could only paste the area you were copying back into the same PDF by using the stamp tool – go figure. So when this question came up in the AcrobatUsers.com community, I had to let them know how easy it is to do in Acrobat XI. I’m organizing some receipts. I scan a receipt for one file and scan another receipt for another pdf file. I want to cut or make a selection in one receipt and drag it into the first pdf file. I tried making a selection for using the snapshot too and crop tool. I can take a snapshot and paste it into a word doc but not another pdf. Acrobat XI, however, makes the entire process much simpler. 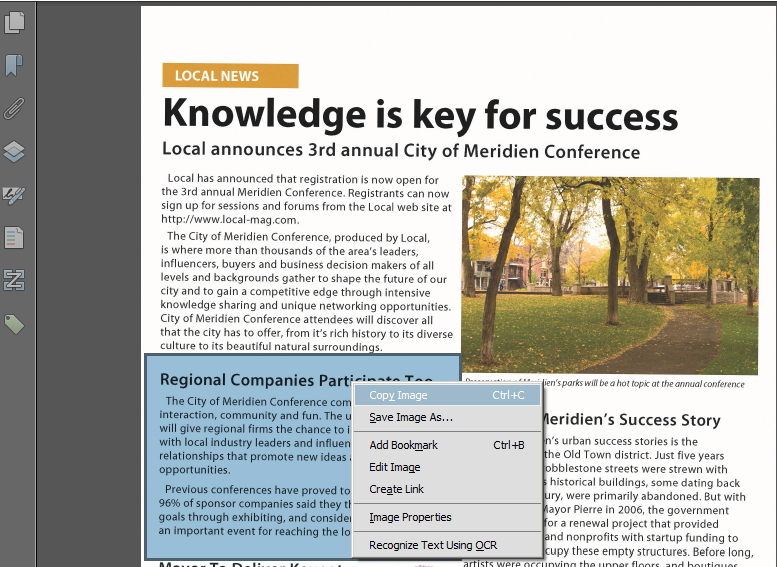 To start, I’ll open a PDF with a scanned image and select an area using the Select tool. Because this is only a scanned image and no text, you’ll only see the cross-hair cursor. Once you have the region selected with a blue bounding box, right-click (Ctrl-click on the Mac) and choose Copy Image from the context-sensitive menu. You could also use the keyboard shortcut Ctrl (Cmd on Mac) + C.
Next, activate “editing mode” by selecting the Edit Text & Images command under the Tools pane > Content Editing panel. 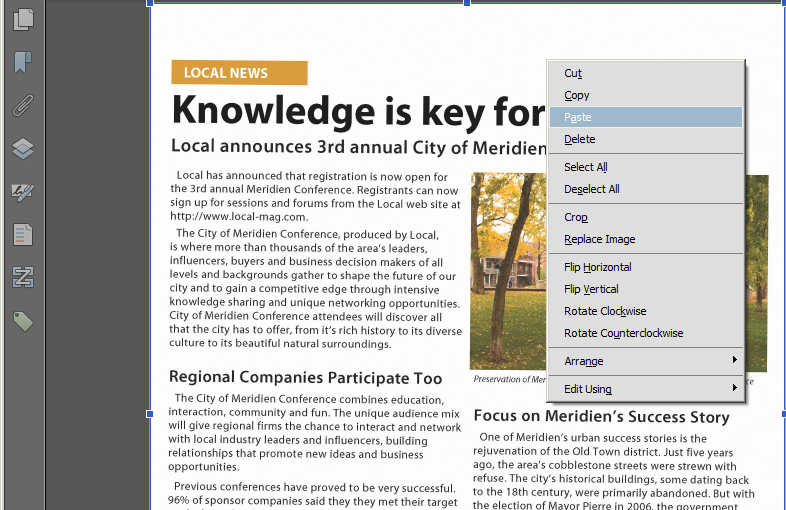 Now all you need to do is select Paste from the Edit menu, context-sensitive menu, or using a keyboard shortcut like Ctrl (Cmd on the Mac) + V to paste it back into the existing PDF or another PDF that is open. If you’re pasting into another PDF that is open remember to activate Edit mode by selecting the Edit Text & Images command. Once the area has been pasted back into the PDF, you can resize the area using the blue handles on the bounding box. If you want to set the quality (or dpi) of the pasted information, you can do this under Edit > Preferences > General category “Use fixed resolution for Snapshot images”. Just remember that if the existing image quality is low (i.e., 72 dpi) then you won’t be able to improve the quality beyond what is already in the PDF file. Also, if you need more white space for your pasted information, you can always create a new blank page in your document using the Insert Blank Page command under the Tools pane > Pages panel > More Insert Options dropdown. I also cover this topic in detail in my Learn Acrobat XI course on Udemy.